I think my life caught up with me today and I have had a headache - bordering on a migraine - all day, so it wasn't a very productive day at all. While putting the wreath on the front door, it got me wondering what the meaning of the Christmas Wreath was. So me being me - I GOOGLED it (I goog le everything). Well that didn't help my headache - there were so many historic reasons, I wished I hadn't wondered at all. A couple of historic reasons were that in ancient Rome, people used decorative wreaths to symbolise victory and eternal love. It's circular shape represented eternity since circles have no beginning and also no end. For anyone out there that has some other meaning I would love to know it. I made my wreath and I really like the two little red robins on it - mainly because they have weird scary eyes. Don't ask me why their weirdness attracts me it just does. I thought I would also share another one of my Santa's with you. 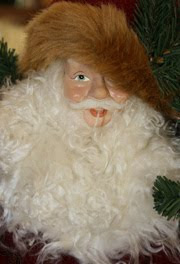 This guy stands about 65cm (about 26in) and he has the sweetest Santa face I have ever seen. I love your Christmas stories, day by day with all those wonderful decorations, Santa, Elf and robins. They all have characters. You have been inspiring me with your collections of Buddhas & Santas ... I wanted to rush out the door and start my own collection for Christmas! 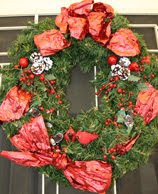 I LOVE your wreath, and the stories behind the tradition ~ thank you. May today be filled with good health and lots of Angels! I used to suffer from migraines but that eased once I had children and they were at school - about that time anyways. They are not nice are they. Are you feeling better now? The hangover effect is an effort too. Cardinals are really pretty fierce. They are not gentle dove-like birdies. They have that "bird of prey" look about them. Hope the headache abates...they just make the day drag very miserably, and the worst part is knowing that the day is escaping without chores done!!! Your wreath is lovely. Hope your headache is gone! Thanks for your great comments everyone - thank goodness my headache is gone. Luize - I do live in a bit of a make believe world, so all my nick nacks have to have a personality. Michelle - I don't know about a book - I am a bit of a procrastinator. Julie - Yes the hangover day is always a bit slow. Penniwig - Yeahtheir eyes are really quite creepy. Joanna - Thanks for you lovely compliment. Your wreath is so beautiful! And your last photo of Santa I just adore! You are sure helping me with my Christmas spirit Davine, for this I thank you!